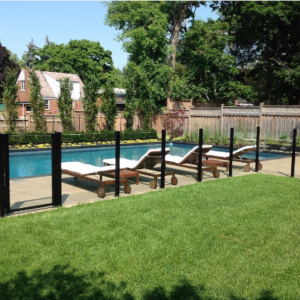 There are numerous reasons why installing backyard pool railings should be mandatory. Most importantly, installing outdoor pool railings help prevent accidents from happening and to ensure pool protection and safety. Do Pool Railings Provide Safety and Help Prevent Accidents? To put this matter into perspective, it is important to examine the statistics on pool protection and safety—or lack thereof in most cases. According to the official Kitchener, Ontario web site, the second leading cause of death for children under 10 is drowning, and an estimated 30 adults die every year from drowning in their backyard swimming pools. While installing outdoor railings around your backyard pool will not completely eradicate the issue, it will help lessen the frequency with which these accidents occur. The advantages of adding pool railings to backyard swimming pools far outweigh the cons (if any even exist). 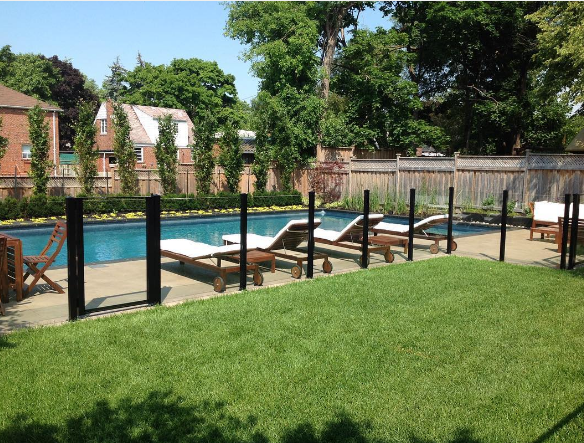 Pool railings can provide safety and help save lives; they can provide a sense of privacy while the pool is in use; and they add a visual appeal to the overall backyard décor. There are many great reasons to install backyard pool railings, but perhaps, the best reason is the pool protection they provide. In most cases, pool railings can even help save lives and prevent completely avoidable and unforeseen tragic accidents from taking place. When it comes to pool safety and protection, it is better to be safe rather than sorry and this must happen sooner rather than later, because once tragedy strikes, it is too late to take action. The fact is that parents do not have eyes in the back of their heads and they cannot be omnipresent, so they must take some extreme measures to ensure the overall safety of their children around the house and the pool is no different. All it takes is a split second of parental distraction or inattention for a child to wander off into the backyard and fall into an unattended, uncovered backyard pool. Most people do not even think that this could happen until it does. That is why backyard below-ground pools, by law, should be surrounded by outdoor railings that are specifically designed for pool protection. Pool railings must be at least five feet in height to prevent children, especially toddlers, from climbing over them. This may seem self-explanatory, but it is actually one of the most important features for pool railings. Many times, people neglect or forget to lock a standard gate behind them, thus negating the purpose of even having an outdoor protective pool railing. Another prominent bonus of installing pool railings is the fact that they provide a great deal of privacy so that you can enjoy family time in the pool in total privacy. They help keep your backyard pool secure from invasive wild animals, such as raccoons, and other unwanted guests, such as trespassers trying to sneak in at night to swim in your personal paradise. In addition to all of the excellent safety features, a beautiful and stylish pool railing will help to enhance the look and feel of your backyard, giving it the ambience of being on your own private resort. This can help to increase the curb appeal of your home if you are ever looking to sell it in the future. Previous Previous post: Can Railing Installation Increase the Value of Your Property?